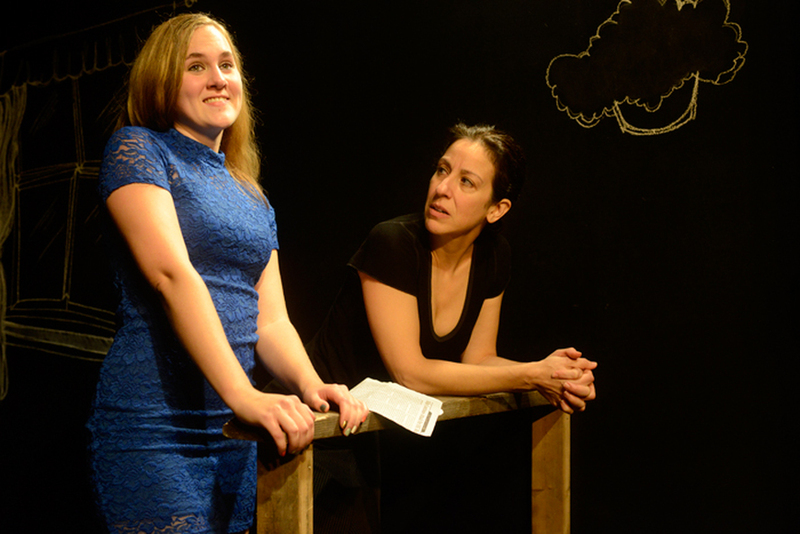 BOTTOM LINE: A mother, a daughter, and the man who unexpectedly comes into their lives, occupy the stage in this wrenching new play that blurs the line between truth and illusion. Who's Afraid of Virginia Woolf is not the only play in New York City concerned with blurring the lines between truth and illusion. In the modest black box occupied by the Bridge Theatre on 54th Street, a new play, The Mentee, has its small ensemble tearing at each other, determined to expose truths and lies, or at the very least feel that bit of vindication from spewing their venomous words. Steven Fechter's play lives in the gap between naturalism and expressionism, and jerks the audience between these styles as it weaves together stark truthfulness and heightened poetry. One may leave the theatre unsure about the actuality of the play's events, but the bitter impact of the evening will linger, like a strong shot of Irish whiskey as it burns after being gulped down. The play begins on the porch of Dana's (Christine Verleny) house as her daughter, Mel (Lulu Fogarty) calls for her lost cat. It is a sunny day in upstate New York, but a tiny cloud sits on the horizon; an ominous harbinger of the storm that awaits. As the clouds roll in, an unusual guest appears at their doorstep. Even though the stranger claims to know both women, neither can recall the man. It is shortly revealed that the man is Chet (Walter Brandes), who was the protege (or mentee) of the family's late patriarch. Chet, a poet, has come to uncover the lost manuscripts of Dana's husband, who committed suicide ten years earlier. The three characters battle over each other's affection, as Chet tries to absorb the life and family of his late mentor. Stories overlap and the characters contradict each other until everyone is turned upside down, rendering the truth as cloudy as the sky above. There is something inherently theatrical about the play itself; it leaps from moments of quiet, to grand and horrific storytelling. Thom Fogarty's stylized direction harnesses Fechter's artistic voice, and causes his actors to interact earnestly at times, and at others deliver their dialogue faced out to the audience, severing their personal connections. This disconnect allows the production to draw attention to those moments when characters savagely cut into each other, and the effect is powerful and rightfully exhausting. The full-blooded performances by the actors stand out against the black walls and the two-dimensional chalk-drawn set (by Mark Demaio). Verleny's callous performance as the stretched-too-thin mother, has an earthy quality that collides with Brandes's Chet who brings a poetic loftiness to his role. As the disturbed daughter Mel, Ms. Fogarty (the daughter of the director), commands the stage with her drastic character shifts. Sweet and seductive one moment and cruel and biting the next, Fogarty's performance is an emotional roller coaster, and she demands that we ride with her. The Mentee is not what one may call an "enjoyable" night in the theatre per say. It is a nasty little play, and by the end of the performance the audience may feel as though they too were put through the ringer. But when shows like ...Virginia Woolf, Death of a Salesman, Cat on a Hot Tin Roof, etc. reappear on Broadway every few years, we have to admit that we theatre folk enjoy the self-flagellation of sitting through painfully wrenching dramas. The Mentee is a similar experience, difficult and confounding at times, but worth the wounds.